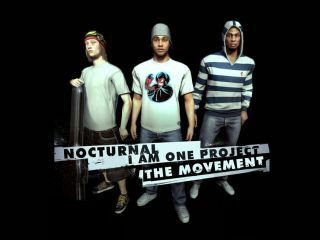 Nocturnal and I Am One Project get a video game character makeover. With Rock Band 3 having the potential to teach you to play an instrument, it's clear that the lines between video games and music software are blurring, and the release of a new single by Nocturnal vs I Am One Project provides further evidence of this. Called The Movement, this was created using the in-game music production tool from PC title APB: All Points Bulletin, which producer Nocturnal describes as "like a more basic version of Logic or FruityLoops". The song is allegedly the first game-produced single to be released worldwide. "I worked on the concept with I Am One Project and came up with the idea of good vs evil in the context of people going into battle," says Nocturnal, who's previously worked with the likes of Dizzee Rascal, Tinie Tempah and Tinchy Stryder. "I created the sounds using FruityLoops then transferred them onto the music editor in APB to create the track. We then recorded the [I Am One Project] vocals using Logic and then had them mixed down"
Other applications were involved in the song's creation, then, but not too heavily, says Nocturnal. "I did some final touches to the track using FruityLoops to get the sound to a higher level. But apart from that the whole track and concept was created using the in-game music editor on APB." You can check out the video for The Movement above, and the single is available to buy on iTunes now.